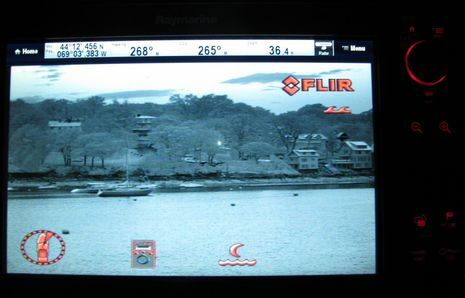 FLIR M-Series nav cam test, Raymarine integration appreciated! Another thing about the detail seen in the image above is that I’m pretty sure it’s better than what I saw coming from the same FLIR 640 x 480 microbolometer in a similar M-626L test camera back in 2009. This speaks to the fact that there’s some serious software involved in turning sensed heat into a visual image, and that FLIR’s is getting better (PDF about DDE here). Note also how the 18°-wide thermal image above covers only a fraction of the 28mm digital camera view at top, and that the top three thermal cameras in the M-Series line each has a different FOV (field of view), because (I suspect) none is perfect. The collage above illustrates the same concept. I’m looking down Penobscot Bay at a nasty ledge, appropriately named “The Graves,” and a nav aid that guards one side of it. I know the thermal camera could see both items well in the pitch dark or the sun’s glare (anything but heavy rain or saturated fog), but could I find them with the cam’s fairly narrow FOV? Which is one reason that MFD integration is such a big deal; tap and “slew to cue” on The Grave’s charted location or its radar signature, and the cameras will whip over to that spot and lock on while you have a good look. At any rate, it was fairly easy to plug the M-618CS ethernet cable — which was communicating with, and powering, an M-Series JCU (joystick control unit) — into a laptop and then browse to the Web Control page seen above (just don’t bother trying it with Chrome). 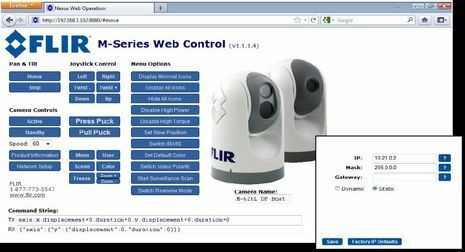 Obviously, the web interface can be used to run the camera system, but I went to the Network Setup and gave the camera the static IP address specified in a Flir instruction sheet. Then I just plugged the same cable into Gizmo’s Raymarine SeaTalkHS (Ethernet) switch and it worked. I could also add one or more JCU’s to the Ray network by giving them static IP addresses (and PoE sources), but given Gizmo’s helm ergonomics and Raymarine’s complete camera interface, I don’t think alternative controls are needed. 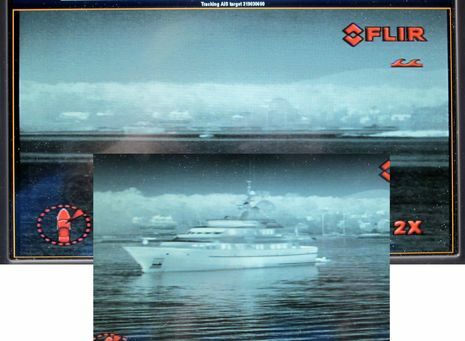 The funky image collage above is an attempt at illustrating the Raymarine interface to the M-Series. As soon as the system was added to the network, the main menu “Thermal Cam” button worked, and I could also create custom screens with “IR Cam” windows (the different default names are a little odd, but custom buttons can be renamed anyway). Now I can pan, tilt and zoom the cameras with the touch screen or with the knob and joystick, which also gives me fast access to the menus. Items you might commonly change, like flipping between thermal and visible (daylight/lowlight) cameras, are on top, but you can dig down to every setup item possible, like how large a sector the automatic surveillance mode will pan, and how fast, or alignment tweaks for the slew-to-cue features. For me, all the controls were easier to understand and use with the e-127 MFD than the JCU, though the latter is not bad. 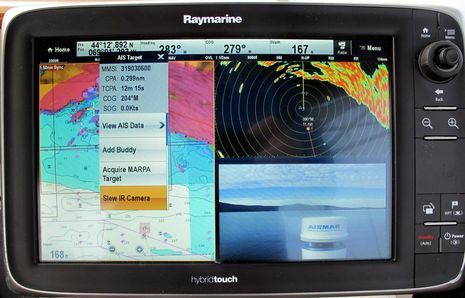 The same was true of the Raymarine e-7 at the lower helm (the M-Series has two analog video feeds, one with just thermal and the other with both video streams). Note how well humans stand out in regular “white hot” thermal greyscale imagery, while the Camden outer harbor scene further up shows how Reverse Video, also known as “black hot,” can look more natural (I’ve yet to find much navigation use for the colorized temperature mapping, but maybe someone has). The screen that begins this entry shows the Ray/FLIR system just before it slewed to an AIS target about 1.5 miles away, and the larger image above shows the results once I’d used the Window button to make the video full screen and then applied 2X digital zoom. The inset is what the tracked target looked like when I got much closer. Note how the running generator location is revealed, because we’re looking at heat, not light. 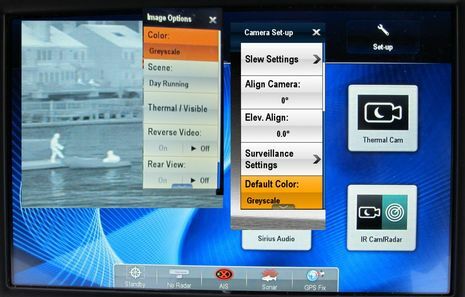 Raymarine’s Lighthouse V7 operating software — which notably runs on all a-, c-, e- and gS Series MFDs — also supports automatic slew-to-cue on certain critical target types. I’ve only experienced the MOB auto slew so far, because I pushed the alarm and was surprised that the cameras seemed to point straight down. I only realized later that an MOB alarm presumes that the person went over exactly where the boat’s GPS is, which in Gizmo’s case is almost directly below the antenna mast. A better test, perhaps with an AIS MOB device, is called for! 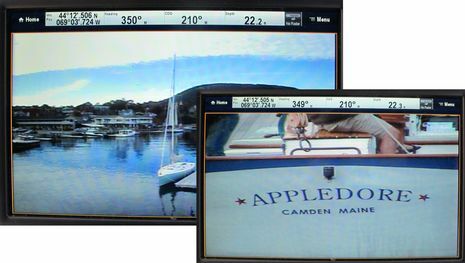 So far, the only notable pan/tilt/zoom (PTZ) camera integration feature that isn’t yet supported by Raymarine is the visual FOV overlay I’ve seen demonstrated on the Furuno NavNet TZT (and in higher-end MaxSea and Nobeltec TimeZero PC charting programs). I suspect that the feature feels like another leap in making nav cameras work easily and well with the navigation process, and I look forward to trying Gizmo’s test TZT with the M-Series and also with the test boat’s Simrad NSS, which got FLIR camera integration with the recent V3 software update. I saw it demonstrated during the NMEA Conference (using the new NSO evo2) and while the integration is not yet quite as complete as the competition’s, I’m sure it will get there. Isn’t it nice to think that a boater might switch his or her primary navigation system and still use an existing nav camera system, which might well be the most expensive electronics item on board? 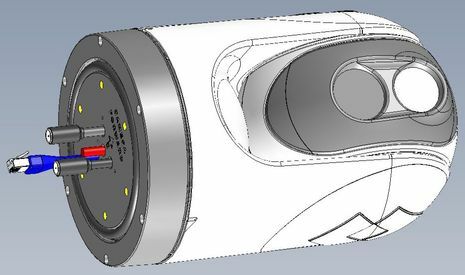 I’m happy to add that there’s news coming regarding the high price of thermal technology, which will be the introduction at the Fort Lauderdale show of a “super low-cost, fully controllable, thermal/daylight dual payload PTZ” Nightrunner camera system by Iris Innovations. I think it uses Ethernet for both control and video distribution, too, and I’ll be there with lots of questions. 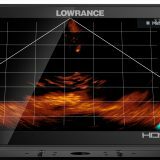 I’ve not heard anything for sure yet, but Lauderdale may also mark the inevitable introduction of FLIR and/or Raymarine branded plug’n’play IP boat cameras, given that FLIR acquired Lorex last year and Ray’s Lighthouse 7 already includes neat record/playback features for attached IP cameras. I can’t help but conclude that at least easy-to-install-and-use daylight/lowlight PTZ nav cams will soon fit into many boat budgets, so I’ll finish with some images showing the zoom capabilities of the FLIR M-618CS’s “visible” light camera. Appledore is the schooner in the distance just tying up with main and foresail still up. It’s like having Popeye at the masthead with a good spyglass, except that you don’t need to supply spinach. And yes, it’s true, I could have been peeping around Camden Harbor like this while laying in my bunk using the RayControl app on a tablet. Next story NOAA erases the Magenta Line, will crowdsourcing step up? One thing I’ll be asking Iris about in Lauderdale is their new Nightrunner camera’s ability to keep track of itself in rough conditions. This is not something most of us would think about — unless the camera started acting screwy — but I’m aware of the issue because of the FLIR M-Series has various settings for motor power and torque. The prospect of a camera system like the one I’m testing at a remarkably small fraction of the price is really enticing, but will there be significant trade-offs? Thanks for this well presented explanation of what is, for us humble rag-baggers, a mysterious gadget of dubious utility. For the last 10 years we have had an old pair of ITT F5000 “Night Vision” binocs tucked away in a locker (devilishly expensive in their day). We used them once in the anchorage at the North end of the Isle au Haut Thoroughfare on a dark and stormy night to ascertain the location of another boat anchored nearby. Since then it’s never been so dark, nor a strong spotlight unavailable to deal with night terrors, so really can’t quite see how useful Flir would be on our sailboat. 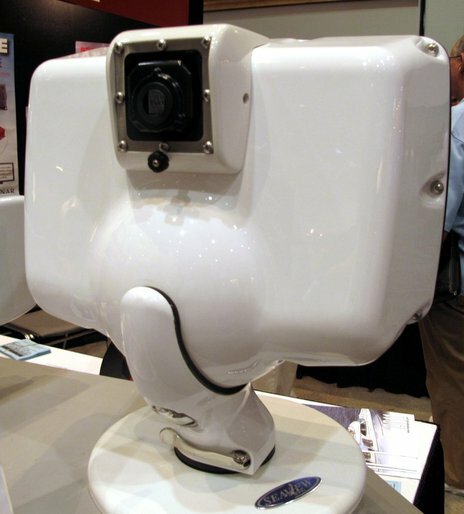 This isn’t meant to detract from the evidence you present here for Flir’s impressive IR vision, but some gadgets, like AIS, are game changers, and some seem to fall into the bells and whistles category. 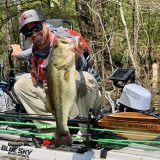 Interesting technology, and a great review! In the past a limitation has been the sensors ability to report its orientation, either relative to the hull, or in true heading. I looked at the latest specs on the FLIR web site and there wasn’t anything stated. Based on NMEA messages slew-to-cue is easy for AIS or MARPA targets, but is it also responding to cursor position or chart data directly? If so then that’s a major step forward for them! I don’t know exactly what conversation takes place between the Raymarine MFDs and the FLIR camera, but the task doesn’t seem too hard. I think that when you ‘slew’ to a point on the chart or radar screen — yes, the Ray integration with FLIR does that — the MFD simply tracks it like a go-to waypoint, constantly telling the camera of changes in distance and bearing relative to the bow. The slew info for MARPA and AIS targets would be the same except that the MFD is also tracking their motion relative to the chart. The Align Camera and Elev. 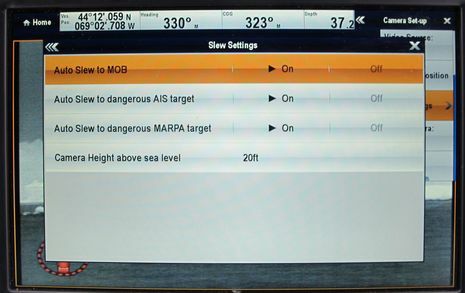 Align commands you can see on the Camera Set Up menu above let you fine tune the cam so it and MFD are in close agreement about where, say, 50 degrees left and one mile out actually is relative to the bow. Inputting the correct height of the camera also helps. It all works slick. Really interesting, but am I right in saying that the M-618CS retails at about US$35,000? Boy, that’s an appreciable % of my total yacht’s cost. Interesting from a techie veiwpoint, but I can’t see it gaining traction in any segment below superyachts at that sort of pricing. Makes me wonder what “super low-cost” from Iris means: only $15,000? But I don’t think that West Marine and/or The GPS Store do much business with superyachts. In fact, there’s an M-Series installed on an old but very well kept Grand Banks 32 here in Camden. 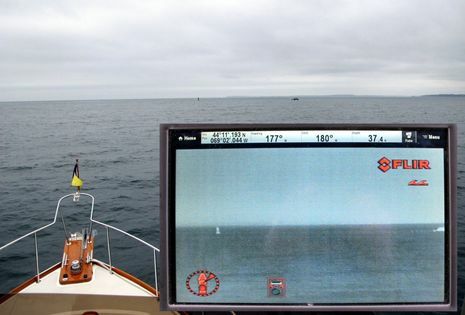 Bear in mind that the least expensive way to get the benefits of a thermal nav cam is probably with fixed models like the newish FLIR MD models ( http://goo.gl/PMmqDj ) or their Raymarine equivalents. Then there’s no complex PTZ casing and no controller or MFD integration needed; you just point your boat at what you want to see. Ben, I bought one of the early FLIR units. I forget the model number it’s thermal only, has a joystick controller and a X 2 zoom feature. I think it cost me a bit under $9,000.00 USD about 4 years ago. I love the unit it works well. Mine has a multi-conductor cable not a CAT5. The unit failed in the 1st 30 days, FLIR shipped me a replacement unit before I even sent them the defective unit. They were great about the advance replacement. I never had a problem with the unit after it was replaced. The problem was in the Imager not the joystick controller. 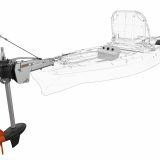 I’m not sure I would want to boat at night without one now that I’ve owned one for a few years. 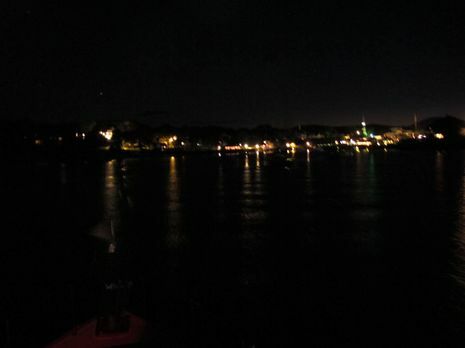 On more than one occasion it allowed me to see unlighted small boats in total darkness way before there could have been a problem. It also works extremely well when transiting narrow creeks and rivers as well as seeing through back lit shorelines. In a MOB situation it would have great value, thankfully I have never had to use it for that purpose. 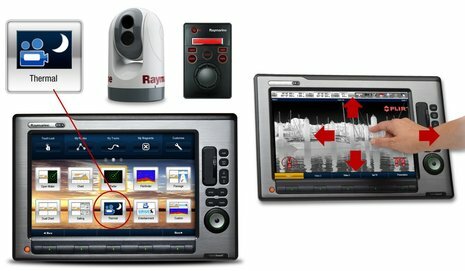 Have posted on our site a complete guide to FLIR / Raymarine fixed thermal and low light cameras. Just got a strong hint of more Garmin news. FLIR is sending around a “save the date” for their “first Integration Partner Cruise” at the Miami Boat Show and the listed partners are: Raymarine, GOST, Simrad, Furuno, Nobeltec and…GARMIN. I’m guessing that we’ll soon hear that Garmin network MFDs will be able to integrate with FLIR M-Series cameras as described in this entry. It’s pretty amazing how FLIR has managed to partner with so many major electronics companies even while it’s apparently helped Raymarine to thrive. It obviously can’t do what the nav cameras can, but could be useful around a boat. Plus the associated can apparently overlay thermal on standard video, which could be darn useful for navigation. I have a raymaine e140 wide and wand to connect my flir m324 to it do I have to change ip address in camera or is my raymarine unit going to look after that? Al, first thing you want to check out is if your E140Wide had been updated to integrate with Flir M Series. I’m not sure but I think not. 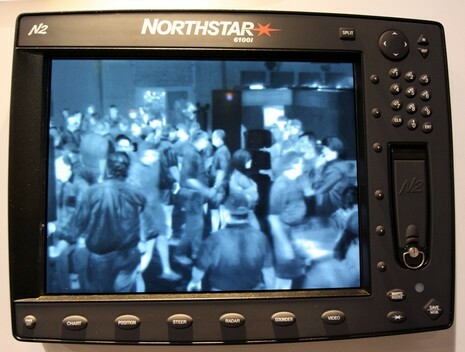 I believe your MFD can display Flir video output fine but that you’ll have to control the camera with a Flir joystick or a more current a, c, e, or gS Series Raymarine MFD.